Lesley will be awarding print copies of “Sky’s End” to ten randomly drawn commenters, and a grand prize of one $50 Amazon gift card to a randomly drawn winner during the tour. Click here for the Rafflecopter. Click on the banner above to follow the tour and increase your chances of winning. Lesley: I say the same thing over and over. Live it. Feel it. Be it. If your story makes you laugh, makes you cry, keeps you up at night, makes your heart race, it will have the same impact on others. Lesley: Hm, this is a chicken-egg question for me. I was going to say characters, specifically a strong hero or love interest, but then I realized he doesn’t exist outside of some sense of plot (thriller, mystery etc). Lesley: Someone who is flawed, and therefore redeemable. Someone who is unpredictable, and by that I mean not formula and thus more real—as in could truly exist. Someone who is mysterious. I mean is there anything more exciting finding out why he’s so dark, stormy and brooding? Lesley: Sky’s End is an intense, roller coaster ride. I wanted readers to be on the edge of their seats. Lesley: Insane. When I am busy with my day-job writing, and fiction I can end up writing for 10 or 12 hours a day. I like to think this makes a better writer but probably just means I spend a lot on massages. Lesley: A neuroscientist. Ha! Then a foreign diplomat. Then a journalist. Now, it’s a novelist. And no, I have not grown up! Lesley: Yeah, and I tell myself this all of the time (to no avail). Don’t take yourself so seriously, cuz no one else does. Lesley: Kresley Cole. Is she even human? Holy machine. She puts out two incredibly terrific genre novels a year. Wow. Susana: Thank you so much for coming today, Lesley! 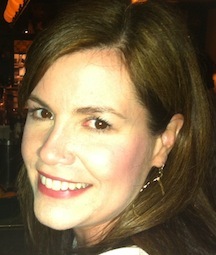 Lesley: Thanks for the opportunity to visit your Parlour, Susana! “You would understand us,” Prime Or’ic beseeches me, hands out. He places them on the downcore, searching the room, until he spots what he’s looking for. He returns with a stool and sits on it, making him eye level with me. A first. “Our beliefs,” he starts and stops. I’ve never seen him this . . . uncertain. “Kirs spend a lifetime training and fighting Aeon. We strive to achieve a perfect Horde, knowing the likelihood is incredibly small. And still we prevail. To get the chance to have, to fight with a sift,” he corrects himself, “with you, is . . . sacred. Once given, it is understood to be a right that is earned. Journalist Lesley Young never thought she would delve into the world of writing fiction, but when she sat down for the first time to put pen to paper, ideas for what would become her first novel just poured out naturally. 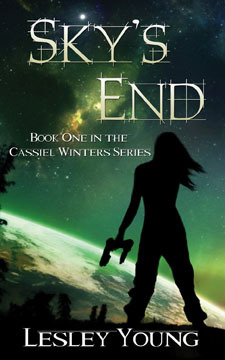 Young’s first book, Sky’s End, is a multi-genre tale that showcases her unique style of weaving romance, action and wit into one page-burning story. Soul Mate Publishing released Sky’s End on July 15 in paperback and e-book and since its launch, it has remained an Amazon Best Seller. The novel is Young’s first installment in a series about Cassiel Winters, a futuristic heroine, and her outer space escapades.